American Library Association announces its 2019 Youth Media Awards! Caldecott! Newbery!! Geisel!! OH MY! We are so excited about the 2019 ALA Youth Media Awards that were announced this week! It’s like the Oscars of children’s literature, with incredible books in all genres celebrated. Just like the Academy Awards (and Emmys, and Golden Globes, and Grammys), some years you are thrilled with the awards, and some years you simply are not. But this year? This year was an OUTSTANDING YEAR! I watched the awards from my desk, furiously messaging with my kid lit friends, and I literally screamed with delight at so many of the announcements. Though many, many books that touched our hearts were not award winners, SO MANY BOOKS WE LOVED this year have authors and illustrators who are jumping for joy tonight, their lives changed forever. We are so excited! 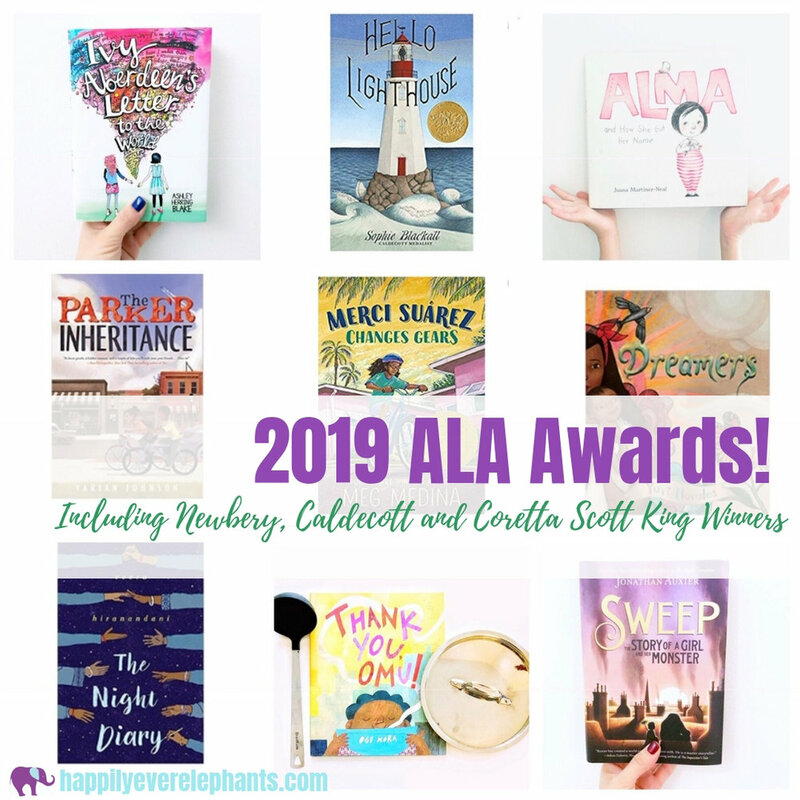 Here is an list of some of the major awards (with a link to the complete list on the ALA website at the bottom), together with affiliate links, links to our blog reviews and any Happily Ever Elephants’ Lists on which the award winners may appear! Without further ado, here are the winners!!!! WINNER: Mercy Suarez Changes Gears, by Meg Medina. I realized this afternoon that this one has been sitting on my desk for months - cannot WAIT to read it! HONOR: The Night Diary, by Veera Hirandandani. The Night Diary was on our Favorite Middle Grade Books of 2018 list! HONOR: The Book of Boy, by Catherine Gilbert Murdock. Ordered 2 copies today - one for me and one for our school library! WINNER: Hello Lighthouse, by Sophie Blackall. A stunner! HONOR: Alma and How She Got Her Name, by Juana Martinez-Neal. Check out our review here! This book made our Favorite Picture Books of 2018 list! 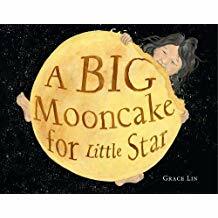 HONOR: A Big Mooncake for Little Star, by Grace Lin. This book made our list of Favorite Bedtime Books! HONOR: The Rough Patch, by Brian Lies. We LOVE this one but haven’t yet reviewed it - it will be on an upcoming list for awesome books about life transitions. 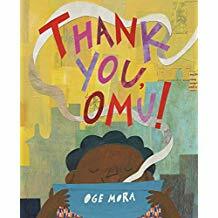 HONOR: Thank You, Omu!, by Oge Mora. Check out our review here! This book also made our Favorite Picture Books of 2018 list, and our list of Favorite Books About Gratitude! This award is given to the most distinguished beginning reader book. WINNER: Fox the Tiger, by Corey R. Tabor. HONOR: The Adventures of Otto: See Pip Flap, by David Milgrim. HONOR: Fox + Chick: The Party and Other Stories, by Sergio Ruzzier. HONOR: King & Kayla and the Case of the Lost Tooth, by Dori Hillestad Butler and illustrated by Nancy Meyers. HONOR: Tiger vs. Nightmare, by Emily Tetri. This award recognizes African-American authors and illustrators of outstanding books for children and young adults. WINNER (AUTHOR): A Few Red Drops: The Chicago Race Riot of 1919, by Claire Hartfield. HONOR (AUTHOR): Finding Langston, by Lesa Cline-Ransome. HONOR (AUTHOR): The Parker Inheritance, by Varian Johnson. This book made our Favorite Middle Grade Novels of 2018 list! HONOR (AUTHOR): The Season of Styx Malone, by Kekla Magoon. WINNER (ILLUSTRATOR): The Stuff of Stars, illustrated by Ekua Holmes and written by Marion Dane Bauer. HONOR (ILLUSTRATOR): Hidden Figures: The True Story of Four Black Women and the Space Race, illustrated by Laura Freeman and written by Margot Lee Shetterly. 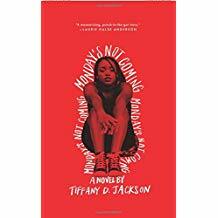 This book made our list of Favorite Books for Black History Month! HONOR (ILLUSTRATOR): Let the Children March, illustrated by Frank Morrison and written by Monica Clark-Robinson. This book made our list of Favorite Books for Black History Month! HONOR (ILLUSTRATOR): Memphis, Martin and the Mountaintop, illustrated by R. Gregory Christie and written by Alice Faye Duncan. WINNER (ILLUSTRATOR): Thank You, Omu!, by Oge Mara. Check out our review here! This book also made our Favorite Picture Books of 2018 list, and our list of Favorite Books About Gratitude! This award honors Latinx writers and illustrators whose children’s books best portray, affirm and celebrate the Latino cultural experience. WINNER: Dreamers, by Yuyi Morales. This award made our list of Favorite Picture Books from 2018! HONOR (ILLUSTRATOR): Islandborn, illustrated by Leo Espinosa and written by Junot Diaz. Check out our review here! HONOR (ILLUSTRATOR): When Angels Sing: The Story of Rock Legend Carlos Santana, illustrated by Jose Ramirez and written by Michael Mahin. This award is given annual to English-language children’s and young adult books of exceptional merit relating to the gay, lesbian, bisexual and transgender experience. WINNER: Julian is a Mermaid, by Jessica Love. This book made our list of Favorite Picture Books for 2018! 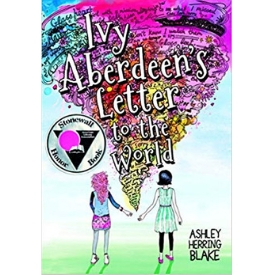 HONOR: Ivy Aberdeen’s Letter to the World, by Ashley Herring Blake. Check out our review here! This book made our Favorite Middle Grade Books of 2018 list! HONOR: Picture Us in the Light, by Kelly Loy Gilbert. This award is presented annually to outstanding books for children and teens that authentically portray the Jewish experience. WINNER (YOUNGER READERS): All-of-a-Kind Family Hanukkah, by Emily Jenkins and illustrated by Paul O. Zelinskey. WINNER (OLDER READERS): Sweep: The Story of a Girl and her Monster, by Jonathan Auxier. Check out our review here! This made our list of Favorite Middle Grade Books of 2018! WINNER (TEEN READERS): What the Night Sings, by Vesper Stamper. This award promotes Asian/Pacific American culture and heritage and is awarded based on literary and artistic merit. WINNER (PICTURE BOOK): Drawn Together, written by Minh Le and illustrated by Dan Santat. This book is part of our Favorite Picture Books of 2018 list! WINNER (CHILDREN’S LITERATURE CATEGORY): Front Desk, by Kelly Yang. Check out our review here! This book made our Favorite Middle Grade Books of 2018 list. This award goes to the most distinguished informational book for children. WINNER: The Girl Who Drew Butterflies: How Maria Merian’s Art Changed Science, by Joyce Sidman. HONOR: Camp Panda: Helping Cubs Return to the Wild, by Catherine Thimmesh. HONOR: Spooked! : How a Radio Broadcast and The War of the Worlds Sparked the 1938 Invasion of America, by Gail Jarrow. HONOR: The Unwanted: Stories of the Syrian Refugees, by Don Brown. HONOR: We Are Grateful: Otsaliheliga, by Traci Sorell and illustrated by Frane Lessac. This book made our list of Favorite Books About Gratitude! 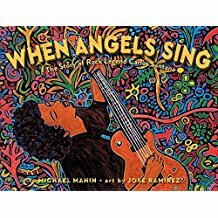 HONOR: When Angels Sing: The Story of Rock Legend Carlos Santana, by Michael Mahin and illustrated by Jose Ramirez. This award goes to a book that embodies an artistic expression of the disability experience. 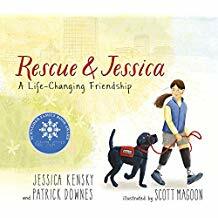 WINNER (YOUNG CHILDREN): Rescue & Jessica: A Life-Changing Friendship, by Jessica Kensky and Patrick Downes and illustrated by Scott Magoon. HONOR (YOUNG CHILDREN): The Remember Balloons, by Jessie Oliveros, illustrated by Dana Wulfekotte. WINNER (MIDDLE GRADE): The Truth as Told by Mason Buttle, by Leslie Connor. HONOR (MIDDLE GRADE): The Collectors, by Jacqueline West. WINNER (TEENS): Anger is a Gift, by Mark Oshiro. HONOR (TEENS): (Don’t) Call me Crazy: 33 Voices Start the Conversation About Mental Health, by Kelly Jensen. For the complete list of awards, including the Michael L. Printz Award, CLICK HERE!